Today, I'm going to talk about factors that cause poor returns in catfish farming investments. Stay glued to this post and read till finish. You know that catfish farming venture like every other agribusiness ventures has its own sweet and sad moments. Most prospective farmers might think catfish farming investment is all rosy until they are hit by a downturn in investment returns. When most farmers encounter such poor returns in their catfish farming venture, they become discouraged. I could remember the first time I started a catfish farm, my catfishes were hit by an infectious disease which caused me to lose all my fishes. A farmer who is no determined like me might feel discouraged and may not want to try to find solutions to the problem. 1. Infections and diseaseas: Infection was what destroyed my first catfish farming venture. I lost everything I invested. A farmer has to be very conscious to detect any infection or disease in the pond water and fishes. Since fishes are in the same pond and share body fluids together, any slight infection in the pond is bound to spread. So pond hygiene, and regular treatment with antibiotics is key to avoid poor returns in this arm. 2. Increase in cost of inputs: This is the most powerful problem facing catfish farming in Nigeria.In the past years, there has been a high increase in the cost of almost all of the inputs used in catfish production. From the construction of the fish pond or earthen pond to the purchase of fingerlings has felt the impact of the bad economy. 72 percent fishmeal was sold for N16000 as at 2008 is now sold for at least N20,000 as at today. There is also a high rise in the cost of other imported feed and feed ingredients like floating fish feed, lysine, methionine, premix, fish meal etc. The local feed ingredients like Soya meal, Maize, groundnut cake are not left out in the price increase. Soya meal was sold for 75 Naira in January 2012 and is now sold for about N130 as at the time of writing this article. This increase might be linked to the decline in value of the Naira against the Dollar. The funny thing about the whole thing is that the prices of selling the table size catfishes are not increasing at the same rate as the cost of inputs, hence the seeming poor returns in investments. 3. The scarcity of crop produce for feed production: Fish feeds are made from crop products like maize, cassava flour, soybean, groundnut e.t.c. The Scarcity of these products in recent times had led to the increase in prices of the products which also impact on the cost of feeds. The scarcity of these products might in one way or the other be related to the unrest in the Northern Nigeria, the major source of these grains. According to economics, scarcity which leads to high demand brings about an increase in prices of such goods. 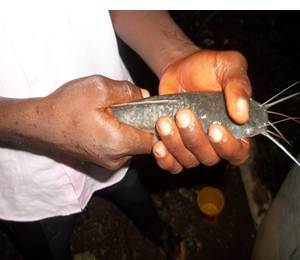 4.Increase in catfish farming ventures in Nigeria : Increase in awareness in catfish farming has generated several millions of investment in the sector. Almost 'everybody' wants to be a catfish farmer, including the very rich investors. These well-to-do businessmen have economic of scale working for them due to almost huge financial resources they have. They can produce in mass at cheaper cost and sell at an cheaper price, thereby trying to drive small farmers out of business. 5. Lack of quality fingerlings for stocking: I was lucky to find a supplier who supplied me with quality fingerlings. Though I didn't weigh the fish(don't forget too), the fishes were quality ones. Imagine what would happen to the investments of a new catfish farmer who was supplied with low quality fingerlings. I bet no farmer want to be in that situation because it is heart-breaking. Also, increase in demand for catfish has led to the influx of low-quality fingerlings in the market. 6. Adulteration of inputs: Many farmers complain of poor growth of their catfishes after using locally formulated catfish feed. These complains have been linked to the adulterated materials used in the production of these feeds. This adulterated inputs are sold to unsuspecting farmers who use them to prepare their catfish feeds. Some of the adulterated feed materials in the market includes adulterated methionine(made by combining sugar and flour), Soya bean meal mixed with sawdust, sub-standard fish meal and a whole lot in the market. 7. Middle men: Some buyers are not even concerned if you are losing or gaining. They just want to rip you off, because they have monopoly in the market. They set the price they want to buy from farmers without considering the farmers cost of production. This usually happen in places without strong union or catfish farmers association. 8. Weak or ineffective catfish farmers association: Some local catfish farmers association are so weak that they cannot even control the influence of big commercial farms out there, who still sell theirs at outraging cheaper prices. Some cannot even regulate prices offered by powerful buyers on their members. So, strong catfish farmers association are very important for good returns in investments in catfish farming as it wades off unneccessary competition. Poor returns in catfish farming investment can be avoided if the neccessary steps are taken at the right time. Sourcing for best quality materials from the right suppliers if you make your own feeds, buying the best quality feeds and sourcing for quality fingerlings for stocking is key for maximum returns in catfish farming investment. Over to you my Friends; Is there something I didn't add or something you want to let me know. I am willing to hear from you in the comment box. Don't forget to share and like.